The travel size of our best-selling Argan & Sea Buckthorn Face Oil. 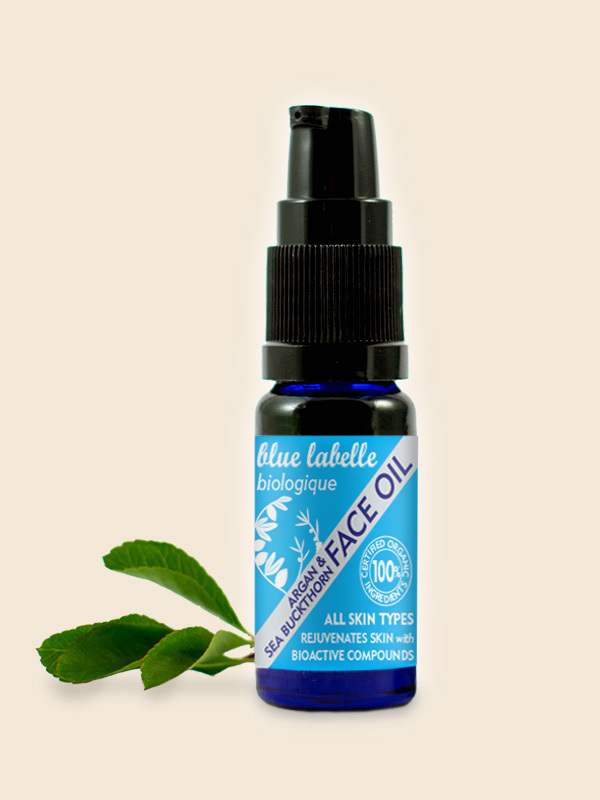 Rejuvenates skin with its premium formula of organic oils. This Try Me / Travel size will last around 2½ months used once a day. Two powerhouses of age-defiance join – Argan and Sea Buckthorn, in a blend packed full of skin nutrients. Each ingredient has been picked for its age-defying properties and bioactive compounds. All of these phyto-nutrients nourish and protect the skin from damage, to help allay the toll that time, the sun, and our busy lives all have on our skin. Read more on the Argan & Sea Buckthorn Face Oil 30ml (full size) page. Argan Oil is a highly nutritious. Sea Buckthorn CO2 extract is abundant in skin benefiting compounds. Macadamia nut oil provides super skin nourishment. Camellia oil protects skin from the environment. Safflower oil leaves skin smooth. Evening Primrose CO2 extract increases skin elasticity. Bergamot essential oil is refreshing, great for combination skin types. Lavender oil is a tonic to all skin types. Roll the bottle in your hands. Dispense 1-2 pumps of oil into your hand, rub hands together, then press the oil into the cheeks, forehead and chin. Normal to dry skin: apply daily, once or twice a day. Oily / blemish-prone skin: the high content of Omega 9 Oleic acid in this blend protects skin from premature ageing & environmental pressures, but Oleic acid can make a product feel too rich for some people who are particularly prone to blocked pores. To avoid this apply the oil at night, or as part of a once / twice weekly pampering night treatment. If you do suffer from congested skin choose a day oil rich in Linoleic (Omega 6 ) acid, such as our Light & Balancing Facial Oil. High quality oil at a super price.. a little goes a long way!